Chelsea were reduced to nine men as they lost 3-2 to Burnley on Saturday evening. 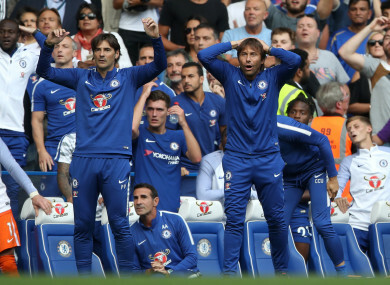 CHELSEA MANAGER ANTONIO Conte blamed a loss of composure after the Premier League champions were shocked 3-2 by Burnley in their opening game of the new season on Saturday. After Chelsea’s new captain Gary Cahill was shown a straight red card in the 14th minute at Stamford Bridge, a Sam Vokes brace and a rocket from Ireland international Stephen Ward saw Burnley go 3-0 up before half-time. Goals from substitute Alvaro Morata and David Luiz brought Chelsea back into the game, but Cesc Fabregas’s dismissal for two bookable offences meant Conte’s men finished the game with nine men. “We tried until the end to reach a good result against Burnley. It was a pity because our fight in the second half was very good,” Conte said. Conte has struggled to conceal his frustrations over Chelsea’s failure to strengthen their squad, with Morata, Antonio Rudiger, Tiemoue Bakayoko and back-up goalkeeper Willy Caballero their only new signings. Bakayoko was absent through injury against Burnley, along with star man Eden Hazard, while striker Diego Costa has been frozen out after being deemed surplus to requirements. The Italian also did his best to allay fears about the thinness of his squad. “We must focus on working very hard with these players,” he said. “As for the transfer market, the club is trying to do the best. I am not worried. I am ready to fight with these players. Email “'We lost our heads': Conte frustrated with Chelsea's discipline during shock defeat to Burnley”. Feedback on “'We lost our heads': Conte frustrated with Chelsea's discipline during shock defeat to Burnley”.